Among jazz fans, Sonny Rollins needs no introduction. For everyone else, here’s a quick thumbnail bio. Born in New York City in 1930, Rollins began his career as a tenor jazz saxophonist in the 1940s. A contemporary of many jazz greats including Miles Davis, Charlie Parker and Thelonious Monk – all of with whom he worked and recorded – Sonny Rollins is considered one of the most important instrumentalists in jazz. He has released more than 60 albums under his own name, and is a sideman/collaborator on countless classic jazz recordings. 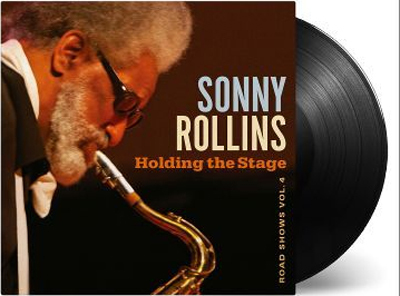 Though health problems currently preclude his playing, the now 85-year-old Rollins has embarked on a series of archival releases, a series of CDs under the Road Shows banner. I recently sat down for a lengthy conversation with Rollins. We discussed his career, philosophy, the music industry, and much more. Bill Kopp: Holding the Stage is the fourth in your series of Road Shows CDs. Have you been recording all of your shows for decades now? Sonny Rollins: I have not. But I am amazed that other people have been recording many of my shows; I find out about them later. Other people have been surreptitious. BK: So are these Road Shows recordings ones that you made, or are they ones that you have collected from other people that made the recordings? SR: Some of them are [from] collectors; one who was credited on the album. And some I made myself. BK: One of the things that is remarkable to me listening to Holding the Stage is the way that it flows. It really does feel like an entire concert, a single concert, even though clearly it is not. Do you have plans to release more albums in this series? SR: (Laughs) Well, I don’t know. I really don’t know at this point. I had intended to record a studio album, but I had a few little health issues that prevented me from doing that. In order to fulfill a contract, I did another Road Shows [release]. But will I do any more in the future? I don’t know; I cannot answer that. BK: The medley that closes Holding the Stage represents the previously-unheard part of your 2001 Berkeley concert. Some of the reviews I read call the recording of that show among the finest work you have ever done. As I understand it, that set was informed by your firsthand experience of living in Manhattan when the Towers came down. Would you say that the emotional backdrop or context for your performances and recordings is important to the music that you make? SR: In that case it was. I mean, it definitely did. I had just experienced that, and everyone had experienced that. I was closer to it and had to be evacuated. But most of the guys were living in New York, so we all went through that whole deal. So that was definitely very important to that particular record. But in general, you know, Charlie Parker used to say that when he played in a concert he was expressing what he lived through that day. And that’s sort of the way it really is. It’s all coming together through our music; everything that happens to us that day, and really everything that happens to us in our life is what we are playing. When you get to the level of being an improviser and a musician on that level, then you are really expressing your whole life. Everything that happens to you comes out through your music, and that’s what you are playing. The so-called good, the so-called bad, the love affairs, anything. Your whole life comes out through your music. In that particular case, of course, that was a very horrific event, and I happened to be right there at the time it happened. So I was particularly shaken. But everyone was shaken: the audience was shaken, the band was shaken. It was some experience. So maybe that came out; I am sure that must have expressed itself somehow in the performance that we did. BK: The Holding the Stage press kit makes mention of the virtue of you having taken control of your musical output. Lack of control over one’s catalog is certainly a common theme among musicians in most every genre. The unfairness of that seems to have been visited disproportionately upon artists of color. Especially for music from the ’50s and ’60s, there are countless stories of artists recording their material and then having no control over what happens with it after that. How important has it been to you to be able to exercise control over your releases? SR: Well, it’s really something which is endemic in the society. It dates back to slavery, really. And in this music business, everyone is a slave: white and black are a slave to the industry. But of course black people are more prone to get taken advantage of. In my case – and in many cases – they tell you how many records you’ve sold, and you have to agree with them. Some people have been really ripped off in music. That’s pretty heavy stuff. I knew the music business was crooked, but I did not realize it was that crooked. So that’s the way it’s been: guys get ripped off. Even today – and, y’know, I am not Prince or Jay Z or somebody that sells these huge amounts of records – but even so, I realize. I have my company now, Doxy Records, but I still have to go to the big distributors to sell my records. So in a sense, I don’t really have control of my own product, because it still has to be distributed. Now, in the future there may be ways to have more control of your own product with all of the new technology that’s coming up, streaming and all of this stuff. But somehow I doubt that I will ever have complete control of what I do. Somehow I think it’s just a dream. So I don’t dream that dream anymore. I just forget about the business part, and try and produce music. That’s a long answer.